"Ha ha, you got the Exorcist baby!" On the surface, My Baby's Daddy is more or less an updated version of Three Men and A Baby with a new millennium slant. Three confirmed bachelors and lifelong friends get the shock of their lives when they find out that their girlfriends are pregnant at the exact same time and that they will likely have their babies on the exact same day. It is an intriguing premise if it weren't so woefully silly and ridiculous, boasting a boatload of talent as well as some potentially great set-ups, but the film is just an out and out disaster from the first frame to the very last. Lonnie (Griffin), Dominic (Imperioli), and G (Anderson) are the three dads, and, learning that they will become fathers at exactly the same time opens up a multitude of predictable situations including one's baby urinating on one of the men, another's puking on them, all as these dads mature and become responsible young men. If it sounds rather bland it is because, well, it is. The film relies on humor that simply isn't there; even the scenes right after they find out that they are going to be dads are predictable and bland. Take G, for example, who, after finding out in the boxing ring that his girlfriend is pregnant, is stunned and of course gets sucker punched. It is a gag that has been seen a million times over and yet My Baby's Daddy relies on it for a key moment of humor. Dumped into theaters in January, a time known for representing lesser offerings, My Baby's Daddy feels as though it may have deserved a better shot. There are moments when it seems as though the filmmakers may have good intentions, including a few brief glimpses into the responsibility of being a father and some glances into what could have been a nice romantic comedy. Strangely, though, the script throws one disgusting or politically incorrect joke after another at the viewer and after a while it becomes ridiculous. The script also resorts to juvenile jokes about matters of race that hit with the thud of a thousand pounds. G's girlfriend is of Chinese descent and, unsurprisingly, her ancestors have names such as Bling Bling, Cha Ching, and so on. I am sure there are at the very least a few people who may have chuckled a time or two, but when a film resorts to jokes aimed at races or nationalities it is a sign of desperation. The lackluster effort put forth by the screenwriters is made all the more frustrating given that the film boasts some truly likable actors. Eddie Griffin is one of the funniest men working in film today and yet here his character is no more than a nerd who is nearly the exact opposite of the type of character we have come to expect from the ever-talented actor. Anderson does a good job in the sort of role that he has become popular for, while Imperioli manages to have a few worthwhile scenes but his character is so poorly written that it could be argued that he never had a chance. Image Transfer Review: The transfer for My Baby's Daddy is a presented in a 1.85:1 anamorphic widescreen image that generally looks quite well. Sharpness and detail are off a tad as the image appears to have a soft look throughout, while colors are done nicely with no bleeding evident. There are no instances of edge enhancement or artifacting. Overall this is a fine quality transfer. Audio Transfer Review: The Dolby Digital 5.1 mix is what one would expect from a comedy in that much of the action is from the center channel. Dialogue sounds fine with no distortion or dropouts evident, while the left and right speakers do a fine job of filling out the musical score. The surround speakers add ambient sounds while also providing support for the musical selections that litter the film. Extras Review: Over 30 minutes of deleted scenes are offered and while they are in abundant supply, they scenes offer no real value. Many are just not funny, while others attempt to flesh out the characters. Overall the scenes are just filler and little more. A gag reel and a seven-minute making of featurette are also available. There has been a recent rash of popular comedians that have taken up family-friendly films in an effort to broaden their fan base. 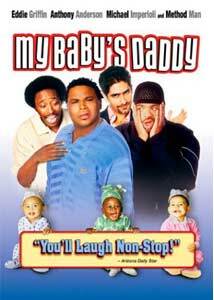 My Baby's Daddy works against the grain and becomes an absolute train wreck of a film.